Empowerment is a tricky topic in most workplaces, because it disrupts the normal working dynamics of an organisation. Most employees would prefer more empowerment rather than more structured decision-making. However, many leaders are not willing to work towards this same goal. In this article, I want to explore some of the reasons why leaders aren’t willing to empower their employees. Benefits of empowerment are clear. When employees are given the freedom to make their own decisions about matters in their jobs, they are able to increase their productivity. Since they will spend less time calling on their superiors to assist them, they can more quickly solve problems on their own with the resources that are given. Empowered employees are also invested employees. Jobs that are too structured and rigid do not attract employees who want to stay put in their job for long periods of time. When more power is given to the employee to deal with problems that arise, they will be more willing to stay in that job versus looking for other jobs. Managers and leadership personnel will also be less stressed out in empowered workplaces. Employees who aren’t allowed to make their own decisions will call on their leaders often, even for small problems that could have been solved easily. Instead, leaders over-exert themselves in an attempt to do their normal job responsibilities while also dealing with interruptions from employee problems. To be fair, it takes a lot of effort to create an environment that promotes employee empowerment. It is not an easy job for leaders in the beginning of the process. This is one of the main reasons that leaders don’t bother with trying to empower employees. It is simply easier not to try something like this that may not necessarily work well and may not be worth the efforts you put into making it happen. 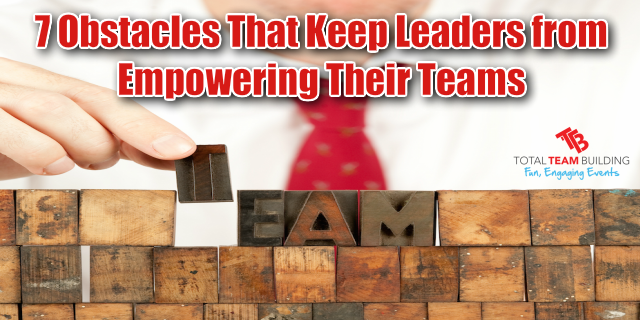 Leaders who are in lower management positions can sometimes fear that if their employees are empowered then they will lose their leadership positions. In theory, if employees can make their own decisions and do more for themselves, management positions could be consolidated or removed entirely. There are two levels of inconsistency that can occur. First, leaders may be afraid that their employees will make inconsistent decisions that will lead to customer dissatisfaction. If one employee makes the choice to handle a problem one way for a customer, but another employee makes the opposite decision later on, that customer can become very dissatisfied with the service they were provided. The second instance of inconsistency is when the leader is not consistent enough in their efforts to promote empowerment. It is necessary for leaders to stay the course and not deviate back towards complete hands-on management. If employees can’t be sure that they will remain with the power to make their own decisions, they will be less motivated to stay empowered. Empowerment programs are not particularly effective for all workplaces, because empowerment needs to be tailored to fit the specific working environment. Leaders who rely on these types of things have probably seen that they are not particularly effective and will be unmotivated to use any sort of empowerment programs again in the future. Leaders that have different definitions of empowerment than their employees won’t be able to achieve anything substantial. Both employers and employees need to be clear on what sort of empowerment goals they are reaching towards. “Be more empowered” is not a clear enough goal. Instead, “recommend alternative solutions” or “handle small tasks on your own” are clearer goals to reach for. Sometimes leaders imagine that customers and employees are both conniving and are working against the company. Because of this, they are more hesitant to allow employees to make their own decisions. If the customer tricks the employee, they might make a costly mistake. If the employees are working against the company, they might make decisions that are counter to what’s best for the company. These perceptions prove to be false most of the time, but they do still exist. Employees that are very stuck in the specific roles of their jobs will not be as willing to become empowered. Roles that are highly rigid and structured can keep employees from wanting to go the extra mile or take more steps to get things done on their own. At the end of the day it all comes down to the culture you foster within the workplace. Getting everyone on board and empowered takes work but it is usually worth it in the end. One strategy is to sit down with your team and establish a team charter that will align the companies goals and values with that of the individual’s goals and values. This helps to set the direction of where the team is heading and reaffirms the reasons why they work for the company in the first place as they need to feel good about the work they are doing and the positive impact it has on the team and the greater community. Team charters also go a long way specifically outlining each person’s role and what they are responsible for. Remember you have hired these individuals for a reason so let them shine at what they are great at and they will be far more engaged and empowered.